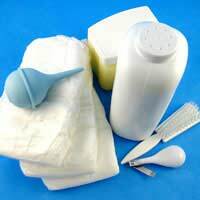 Despite their tiny size, babies are huge consumers, from baby powder to soap and nappies to wipes, your baby needs a wide range of toiletries every singe day. But your baby is precious, their skin is sensitive and you want to be sure that you are using products that are not harmful to them and that are gentle for their developing body, so how can you become a savvy shopper? Chemicals and artificial substances are common in most products and reducing exposure to them is of great benefit to your baby's general health, growth and development. Concerns about toxicity are moving many parents to examine green choices for their babies. There is a wide range of natural alternatives out there, products that are carefully designed and created for their quality, purity and safety. Almost 3 billion nappies are thrown away every year in the UK. About 90% end up in landfill sites, where they decompose very slowly. Washable nappies are the green alternative. One advantage of washable nappies is that they are much less expensive than disposable ones. Organic cloth nappies are also free of pesticides and synthetic chemicals often found in disposables. Of course if you are using cloth nappies it means you are going to have a greater amount of laundry. Laundry detergents have a big impact on the environment; this is because many of them contain ingredients such as phosphates which are slow to biodegrade in the environment. Earth-friendly laundry liquids are made from natural, plant-based surfactants which are biodegradable. Some of them also have built-in soya based fabric softeners. They are also hypo-allergenic so that they are gentle to a baby's sensitive skin. If you want to keep your baby's bottom smooth and nappy-rash free, there are several ranges of green nappy balms on the market. They contain all natural products such as sweet almond oil, organic olive oil, cocoa butter and beeswax to act as a barrier cream. Many of them also contain gentle essential oils. Petroleum-free jelly usually incorporates a combination of beeswax, shea butter, sunflower and coconut oils. Herbal Baby wipes are made with aloe vera and tea tree for sensitive skin. There are several ranges of biodegradable, flushable baby wipes available from companies including Naturebotts and Little Green Earthlets. These gentle skin creams are usually made from an all natural base of sunflower oil, rosewater and organic beeswax. They can be mixed with a drop of lavender oil and rubbed on baby's chest to make a natural and soothing decongestant. Your baby's skin is very sensitive and many soaps are just too harsh. Organic baby washes are made from a combination of gentle herbs such as red clover and lavender which are gentle and soothing for sensitive skin. Many of them also contain extracts of corn or coconut oils which help your baby's skin retain its own natural oils and aloe vera to protect from irritation and dryness. If you want to move away from talcum powder there is a range of corn powder based, talc-free baby powders. Some of them are unscented, while others contain lavender oil which as well as being a pleasant scent is also a natural germ fighter. Organic baby shampoos are very gentle, made especially for fine new hair. Many of them contain aloe vera, camomile and extra virgin olive oil to maintain the natural oil and acid balance of a baby's delicate skin.